Home Cooked Catering at its Best! Janet, at Kirrie Dumplings Catering in Kirriemuir, is a well known and respected caterer in Angus, covering events throughout the county as well as Dundee and Perth. 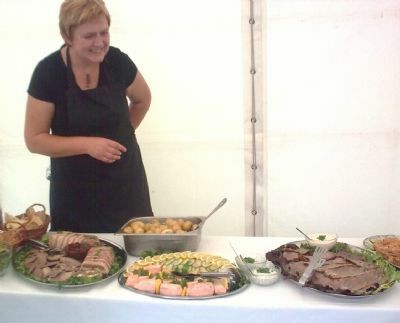 Catering for sponsored lunches, dinners and balls at Strathmore Rugby Club in Forfar, or weddings, high teas and party buffets around Angus, Janet, of Kirrie Dumplings Catering, has built an excellent reputation for delivering high quality food using seasonal produce. From freshly made sandwiches and wraps for finger buffets, to locally sourced produce for dinners or plated buffets - not forgetting delicious home made cakes and desserts - the Dumplings have the flexibility, skill and imagination to match your needs. If you are looking to celebrate a family or business event then check out some of our menu options or discuss your ideas directly with Janet, who will provide a friendly, professional service to make sure you enjoy your event.